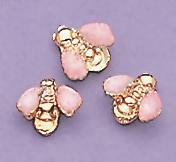 White Metallic Baby Bee Tacs in gold setting. Price is per package, 12 to a package. Made in the USA.